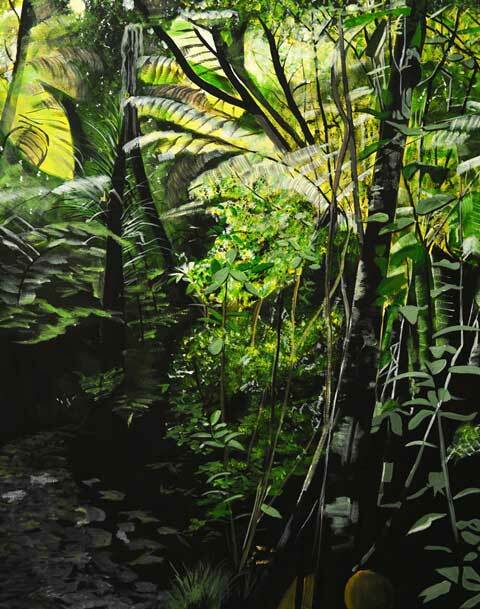 Inspired by the artist’s walks in the Titirangi bush, Bush Walk is an exploration of natural light and shadow, from the brightest sunny yellows to the deep cool greens of this bush. The technique used means there is a photographic effect when the painting is viewed from afar and an Impressionistic brushstyle when viewed up close. Acrylic on canvas, and painted for the artist’s first solo exhibition in 2012.